In hindsight, the innocence of our shock facing such simple component deception seems almost quaint. We were stunned by the sheer audacity of the fraudsters and did not realize that hawking empty capsules as real components is actually one of the more benign forms of counterfeiting. Counterfeit electronic components, at that time an almost unknown issue, would accelerate in the 10 years following to become a visible and acknowledged problem with thousands of reported incidents in 2005 which in turn increased another 300% by 2008. The issue of counterfeit components pivoting around the turn of the millennium is closely related to fundamental changes in the electronics component supply chain at and around that time. The admittance of China into the World trade Organization (WTO) in 2001 resulted in the lifting on export bans for non-governmental entities. A surge of manufacturing outsourcing and the development of global shipping shifted the manufacturing center of gravity to Asia, specifically China, a region with weak protection and understanding of intellectual property, creating distance between the OEMS and their supply chain. Somewhat earlier, major efforts to establish a responsible E-waste handling led to a massive export of hazardous waste in the form of discarded electronics to China and other developing countries, creating a substantial industry centered on e-waste recycling. This industry, intended for the recovery of precious metals from electronic assemblies, became a growing source of reclaimed electronic components. The word counterfeit invokes associations of unauthorized copies. An early and famous case affecting thousands of computer motherboards involved a capacitor electrolyte made from a formula first stolen, then corrupted, which caused the capacitors to burst and the computers to malfunction. The case alone cost the computer makers more than USD 100 million. However, making copies, now specifically termed cloning, is just one of many ways of creating counterfeit parts, and not even the most common. Other major sources of counterfeits are excess inventory improperly disposed of, legitimately produced parts rejected by the test process, legitimate parts re-marked and re-labelled as parts of better performance and the aforementioned empty capsules. But the most common, and perhaps most sinister counterfeits are parts reclaimed from used and discarded electronic products, primarily in Chinese backyard operations. The boards are typically heated over open fire to as much as 400°C (far higher than the approved rated reflow temperature) to liquefy the solder, then hit and thumped to the concrete floor until the parts fall off. After sorting and cleaning in whatever water is available at the site, the top markings are ground down and a new topcoat is applied before the parts are marked, labelled, packaged, and reintroduced as fresh parts through the grey market. This group constituted an estimated 80-90% of the component counterfeit market in 2012, which in turn was assumed to be 8-10% of the total electronic components market and representing an annual revenue loss of USD 7-8 billion to the semiconductor industry. However, this is only a fraction of the overall cost counterfeit components represents to society, albeit maybe the only one that is close to quantifiable. Correcting a problem invoked by a counterfeit component, once detected, may exceed the value of the components by orders of magnitude. A counterfeit component not detected may cause serious loss of infrastructure in the worst case, and the loss of life and safety for people. A salvaged waste component already spent an unknown and possibly significant percentage of its useful service life before being recycled. Add to that an unknown, and possibly inappropriate service situation, and the fact that the part is on a board that has been discarded, and it is clear that re-claimed electronic components can only be legitimately used in non-critical applications. However, the vast majority of reported counterfeit incidents are in the military and aerospace segments, and includes cases involving safety and mission critical systems. It is clear that these segments are particularly susceptible to counterfeits, and not only discovering incidents to much higher degree. Since the 2011 reported discovery of counterfeits in major military systems like the F16 fighter jet, and the realization of the risks it represents, the attention on fighting counterfeits has been intense, far greater than in regular commercial markets. The test and qualification regimes of the defense sector along with the consciousness of the consequences of failure contributes to a superior detection of substandard quality. However, defense and aerospace, with product lifetimes spanning several decades, are especially mismatched to components life cycles of a few years, and do rely on a steady supply of components that are in effect obsolete. These hard-to-come-by parts are most easily found in the grey market. Hence, the problem of counterfeit components are closely related to the ever-mounting problem of obsolescence and life-cycle management (see article in the previous issue of Interrupt Inside). On the face of it, avoiding counterfeit components should be simple; buy components directly from component makers and reputable authorized distributers only, and you have no problem. Not until you need a part not available through those channels, that is. Considering a complex military system like a fighter jet or a helicopter, adding to it variants, upgrades and maintenance, it is obvious that the supply chain is extremely large and convoluted involving sub-contractors with sub-contractors at multiple levels. Each of them battling their own difficulties with obsolescence, lead times, delivery pressure and cost, and with varying levels of maturity and control handling the parts supply, not to mention ethics. The temptations to make use of the grey market are multifold. A vendor of a sub-component pressured and committed to a delivery date but missing a handful of critical components, gets instant relief from a smaller broker. An EMS provider, cut to the bone on price by his customer, sees the opportunity of recovering some of his profit procuring the most expensive parts from another friendly broker. The appearance of counterfeit components in military planes is no mystery, once you know it. Early topcoats could easily be removed with an Acetone wipe, and date and lot codes printed on the components themselves were often incorrectly formatted relative to the specifications from the vendor. Fakes were therefore relatively easy to detect once looked for. However, counterfeiters are steadily getting better at what they do, so the technology to detect frauds must improve as well. 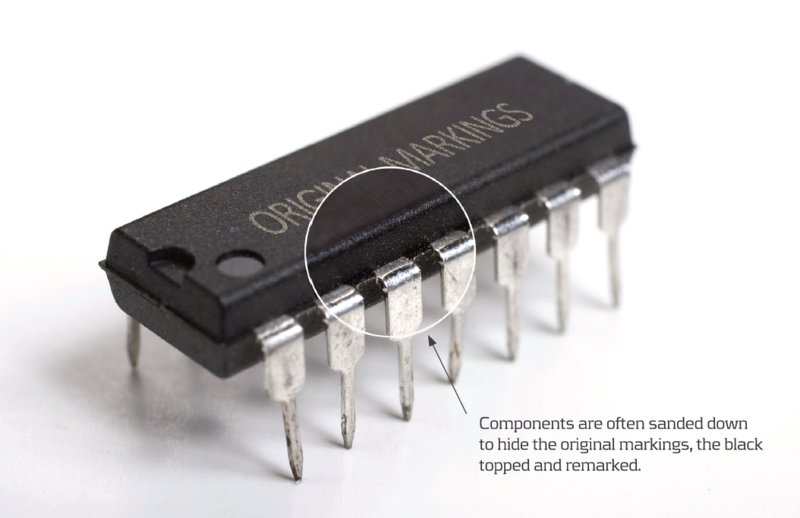 Companies are, as an example, working on using botanical DNA to mark chips, and the use of RFID tags has long been considered, but the long term impact of improved marking will only be relevant for cloned components. 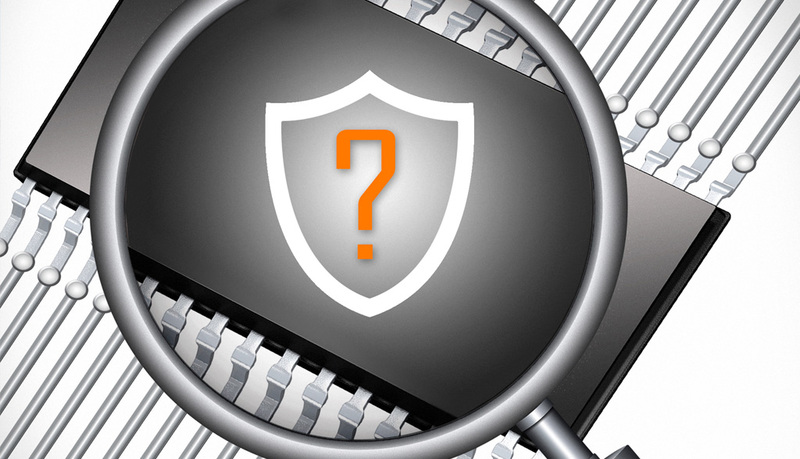 To aid detection, IPC has developed inspection training and certification for detection of counterfeit components. One must assume that frequent re-education is necessary. Several automated test and inspection systems targeting detection of counterfeit components are also about to hit high-end markets. Parallel to improvements in process and technology, the distribution of counterfeit components is fought in American courtrooms. In response to relatively resent definitions of new offences introduced in law motivated by the appearance of counterfeit parts in defense systems, the FBI has stepped up its investigation of component fraud, and several American brokers have been subject to high-profile prosecution and sentenced to lengthy incarceration. The message is clear; if you supply US defense companies you need to be sure that all components are genuine, or face charges and prison terms. The original “manufacturers” and distributers of the counterfeit parts are of course still out of reach. Inspection and prosecution aside, getting on top of the counterfeit component problem necessitates getting in control of the supply chain. Traceability from manufacture through distribution and assembly is inevitable for any OEM or sub-system manufacturer who wants to be confident that their product is clean of counterfeits. Also in this context, coordinated industry responses are important. Like the SAE internationals standard AS5553 for procurement of electronic parts, and directly motivated by volume of fraudulent parts in the supply chain. Counterfeit products are not limited to electronic components. Fakes, primarily clones, are widespread in all markets. Every year more than a 100 million fake phones are put in circulation. Fake ball bearings, car parts, cables, network servers, safety textiles, vehicle airbags and many more are well known and severe examples of counterfeits discovered. Considering the profits involved, the fragmentation of the supply chain and the many pressures on manufacturers, there is little reason to expect the fight to end counterfeiting to be successful. It appears that the only path to successful avoidance of counterfeit components goes through solid life cycle management. The link between counterfeit component avoidance and obsolescence management cannot be overstated, and actions taken to avoid “distress procurement” are also actions to keep fake components out of the factory.